What kind of plant-based dietitian would I be if I didn’t post a lentil soup at least every couple of months? Incredibly nourishing and easy to throw together, a giant bowl of lentil soup is one of my favorite meal options. This version is no exception, a rustic take on the classic. Simmered lentils, lots of spices, tomatoes and a generous helping of kale. This is one soup you’ll want to make all winter long for simple, weeknight eats. I love it so much that I often double (or triple) the recipe: one for us, one for the freezer and one for a neighbor. This time of year, almost everyone is in need of a good, home-cooked meal. After my recent trip to Italy, I’ve been partial to cooking with the flavors of Tuscany: tomatoes, oregano and basil. This lentil soup was no exception. I’m sticking with dried herbs since it’s the middle of December, which still pack a potent punch as long as they are fresh. I’m been partial to grabbing spices out of the bulk bins (my local Fresh Thyme and Whole Foods has them) to ensure that I’m just getting exactly what I need. That way, I’m saving money and not packing my precious pantry space with oversize spices that will be stale in a year. 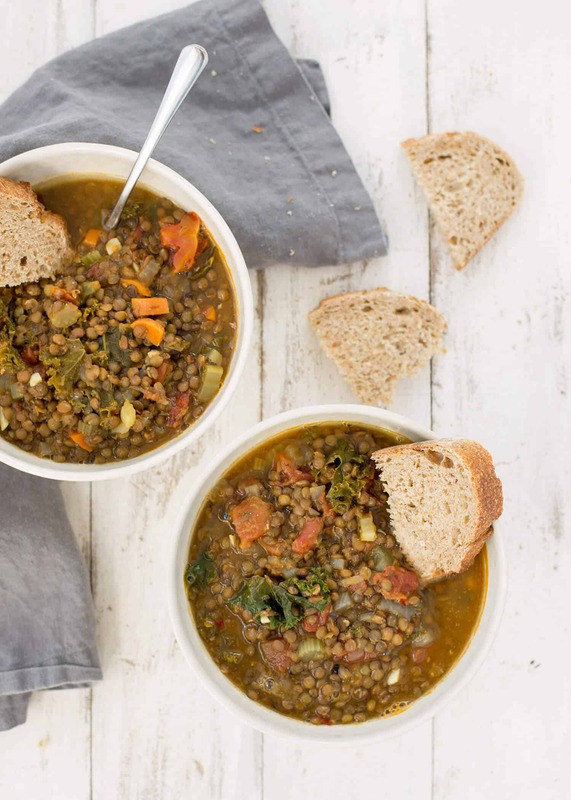 Best of all, this lentil soup is packed with plant-based protein. With 18g of protein in every cup of lentils, it’s a must make this winter. Tuscan Lentil Soup! 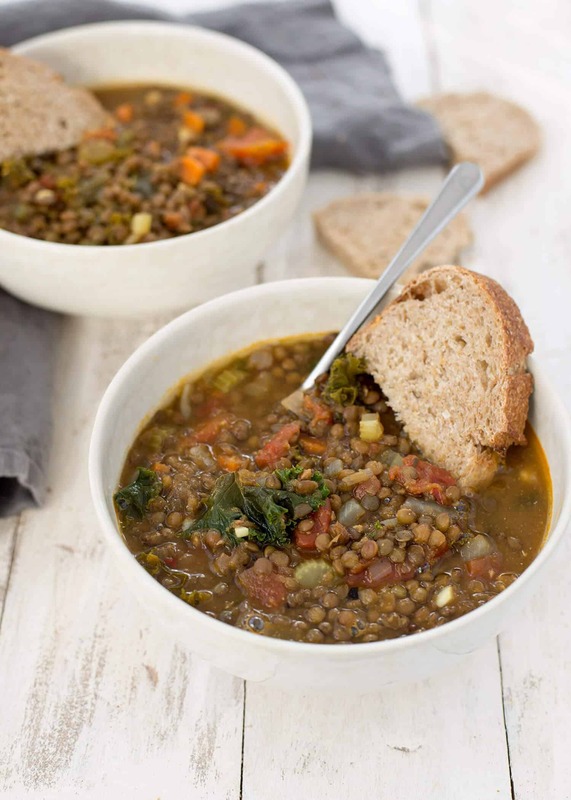 Healthy lentil soup with an Italian flair. So delicious and perfect for winter! Gluten-free and Vegan. Place the lentil and 4 cups water in a medium saucepan over medium-heat heat. Bring to a boil, then reduce heat to a simmer. Cook, until just tender, about 25-30 minutes. Heat the olive oil in a stock pan over medium heat. Add the onion, carrots and celery. Cook until vegetables are tender, about 5-7 minutes. Add in the garlic, oregano, basil and crushed red pepper. Stir until just headed through, then add in the bay leaf, tomatoes with juice, lentils and vegetable broth. Simmer over medium-low heat for 15-20 minutes to let flavors develop. Season to taste as needed with salt and pepper. I tend to start with 1/4 teaspoon and go from there. Stir in the kale and cook until wilted, about 10 more minutes. I love this soup with a little parmesan cheese sprinkled on top. 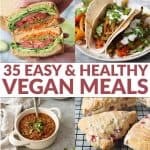 For dairy-free versions, I use my homemade vegan parm or one by Follow Your Heart. Yum this looks so delicious, warm and filling! Awesome- glad you liked it Lizzie! I note the call is for FRESH lentils. I don’t believe I have ever seen fresh lentils in a store. I do have a plastic bag with a jack rabbit running past, full of brown-looking lentils. Ha. You are right. I don’t know why I wrote fresh, that’s an odd word. Dried lentils is what you want! I’ll change it now. Brown or green will do. The recipe was made (almost) as written. I am not vegan, so I used turkey stock in place of the vegetable stock. The spice palate and proportions were on point and I will definitely make this again. I will definitely make a veggie stock next time. Thanks for your comment! Glad you liked it. 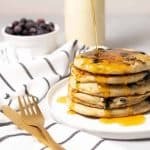 What could i substitute for kale? Spinach? My husband hates kale. Thanks! Hi Allie, spinach should work great! Hi Alana- I would make it without the orzo and then freeze it. Then, when you are ready to eat it, add in the fresh cooked pasta. This looks delicious! If I wanted to bring this to a new mom as a freezer meal, would I cook every thing as the recipe says and just freeze it and have her warm it up when she’s ready to eat it? This is one of the most delicious soups I’ve ever made! It will be a go-to from now on, and I’ve already passed it along to friends, so than you! I added some extra peppers, because I’m a hot-a-haulic, and some nutritional yeast, because I add that to everything, threw in some tomato paste and used fire-roasted diced tomatoes. Otherwise, I followed the recipe. It is so hard to not keep eating it. And the health factor makes me feel virtuous, so thank you! Can I double this recipe? I would like to have extra for the week.